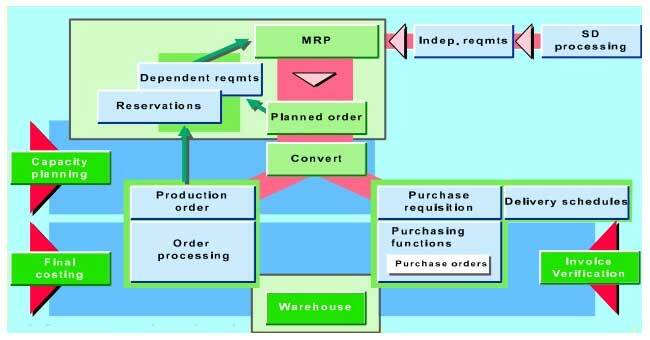 MRP means Material Requirement planning. It helps for inventory management of material. MRP1: In this view,maintain the min. & Max stock of material that must be required for plant that is level of matarial that is required & before stock is less than the min. stock it is to be procured. MRP2: In this view, who is the requisioner plant/where it used that data will be maintain in this view so they can also make PR for that material. If you want to get more simplicity and a more refined method of material requirements planning with in a plant you would have to MRP (Material Requirements Planning). By using this method the MRP area signifies a structural unit which will help you to bring all your Materials Requirements Planning independently. Infect you will be able to display is specifically for each MRP area. By using MRP you will able to get one or more storage locations of a plant or a subcontractor for the materials planning of the parts to be offered, Although you can allocate a material to various MRP areas. Each MRP area can, for example, parallel to a muster line, a provision storage setting or standard with a subcontractor. You can exactly plan self-governing supplies for extra parts or other superior supplies for distinct MRP areas. At this time, you carry out Material Requirement’s Planning at plant level. The numerous supplies were merged in the planning run and procurement elements were generated for these attached supplies with unknown foundations. It will also permits you have to get exact control of the staging and procurement of important in –house production parts and purchased parts for every shop floor and assembly area. You can similarly plot the delivery of components for the separate subcontractors. Hope this article might help you in understanding the MRP.